After some last minute revision, the train arrived at Rooty Hills train station, from which I cycled to the BWRS head quarters. 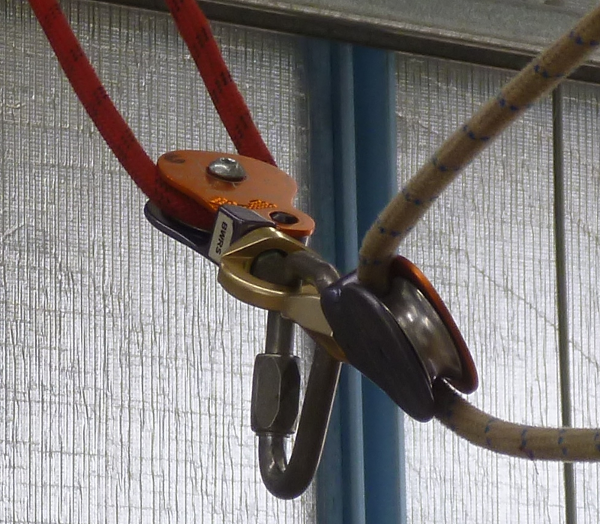 Ropes should be static, of Kernmantle construction, and have a minimum diameter of 11mm. They should also be purchased from a reputable manufacturer. The core should be of a contrasting colour to the sheath so that points of wear are more easily identified. (this is a similar proccess to calculate the minimum required strength for a crab). We can determine the MA by considering a force F applied to one end of the rope. Pulleys will reduce the force by a small amount (due to friction) but this is typically negligible and the ‘ideal pulley’ can be considered to just change the direction of the force. If we follow the rope to the second pulley we can see that it has a force F on both of the ropes in it. Summing these, we find that the fixed end of this pulley experiences a force of 2F. Repeating this we find an effective force of 3F on the other end of the rope. This is a MA of 3F/F or 3:1. On the right is a 5:1. Unless absolutely sure of an anchor’s integrity, two anchors should be used to introduce redundancy and load sharing. The anchors should also avoid sharp edges – edge protection should be used where nessacary. there are two main methods of attaching a tape around an anchor. One is to wrap a pre-tied loop around the anchor and secure with a Mallion. Another is the ‘wrap 3, pull 2’ method; this method requires the tape to be rapped around 3 times before tying the ends together. You then ‘pull 2’ ensuring the 2 you pull don’t have the knot in them. This method has the advantage of self aligning to the direction of pull. It also won’t slide down a tree trunk. Y = ok, maximum angle of 120deg (each anchor is taking 100% of the load. T = trouble. anchor failure more likely. We then returned downstairs for some lunch followed by some more exercises. This time we looked transporting loads horizontally. The first systems we looked was offsets. This involved lifting a person off a chair, up over an obstacle and placing them on another chair. 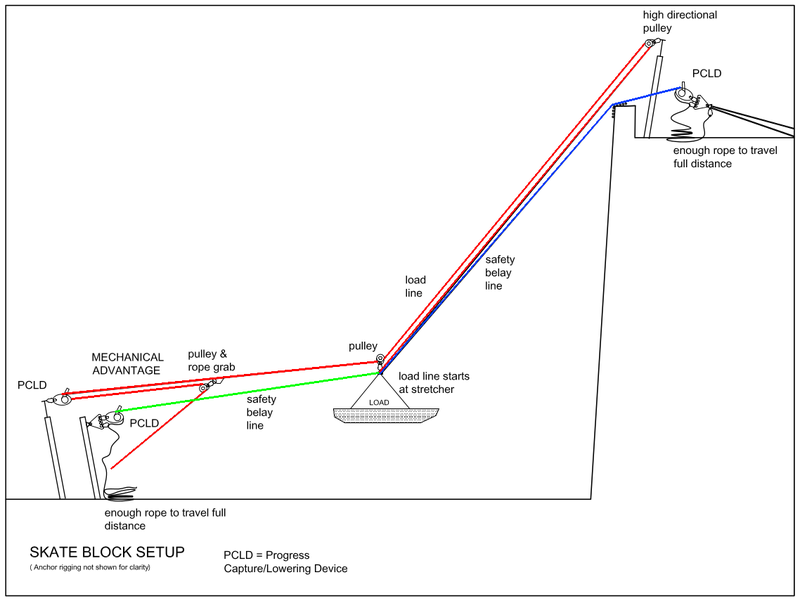 Whilst conceptually easy to understand how the lengthening and shortening of the different lines can be used to maneuver the load. It took the team leader to coordinate the two teams/sides for effective results. High Lines are needed to transport across horizontal traverses and to allow combined vertical and horizontal movement off high structures such as towers. The skate block system provides horizontal/vertical transportation system that doesn’t generate as large forces when compared to span line systems such as Kootenay High Lines. 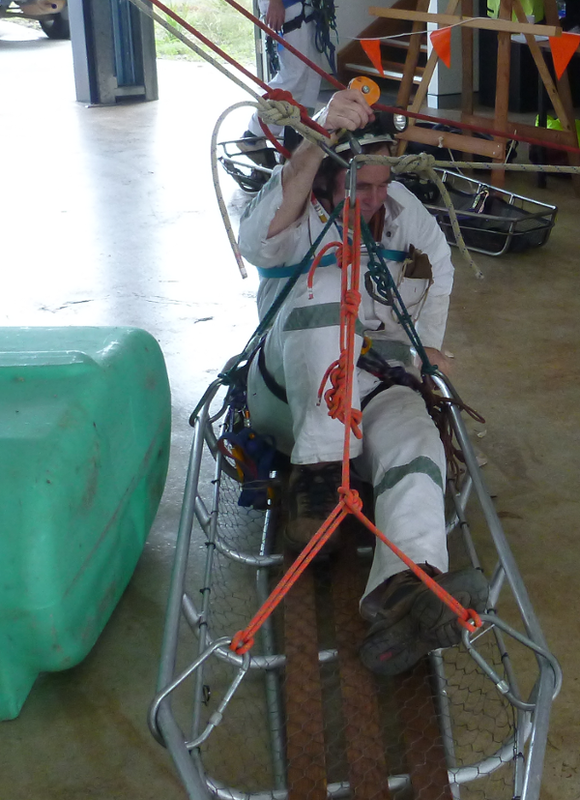 The load line starts at the stretcher and extends to a high directional pulley. It then goes back to the stretcher and through the pulley before going through a progress capture/lowering device and MA. The fourth and final day of the course was spent just north of the bridge in BP park Waverton (which meant I could cycle there – with a missing pedal). This day was primarily for assessment and consisted of a number of mock rescue situations. The situation was changed around and everything had to be rigged and de-rigged each time. I’m not sure if it was nerves or lack of personal equipment, but I feel I didn’t perform as well as I could and should have. Edit: 30/12/13 – I have ordered quite a lot of new gear which should make things easier.